This is Number 4 of a series. The design is inspired by Texas County Courthouses, built around the turn of the 20th century. There was a building boom of stone historic architectural revival buildings styled in neo-classical, Romanesque and other styles, many with with clock towers and domes. The county courthouses for Harris County in Houston, Ellis County in Waxahachie, Bexar County in San Antonio, and Caldwell County in Lockhart are but a few examples of the inspiration for this ornamental turning design. This piece is made of African Blackwood with Mother-of-Pearl and brass inlays. The size is 3 1/2" D x 10 1/4" H. The removable tray is made of cocobolo. There is an inlaid "Yellow Rose of Texas" pattern cut into the top of the handle of the tray. Both top and lower dome lift off — the top to expose a compartment housing the clock movements and the bottom to expose a removable tray with storage space below. Ornament consists of a fluted skirt below the finial, Mother-of-Pearl cabochons set in gold-filled bezels, MOP dot inlays and MOP strip inlays, a row of dentil molding below the upper and lower domes, a pattern of 60° V-cuts on the body, and brass tube filled with black delrin rod to create the gold ring inlays. 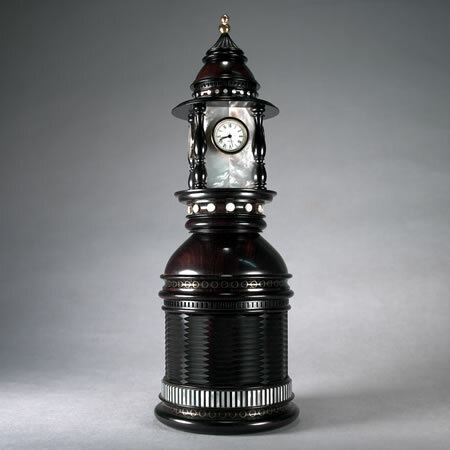 The ornamental columns surrounding the MOP panels housing the clocks are 3/4 round and are matched hand turned. Click on any thumbnail image to see a larger image on the right.